'Hello, Goodbye' is now just goodbye. 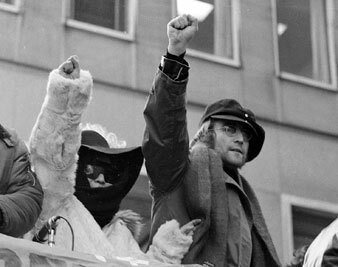 John Lennon and his wife Yoko Ono raise their fists as they join a protest, Feb. 5, 1972. ‘Hello, Goodbye’ is now just goodbye. John Lennon was born in 1940, when the bombs were general all over England. War was a commonplace of his childhood, and when we try to sort out what he brought to the generation that mourns him so deeply, we naturally think first of his music, and then of the ways in which he and the Beatles tied that music to the peace movement of the late 1960s and early 1970s. The Beatles, and John Lennon in particular, used their huge popularity to disseminate a sort of benign antiwar publicity politics. “War is over, if you want it,” Lennon and his wife, Yoko Ono, proclaimed in full-page Christmas ads in 1971. Their messages were occasional, diffuse and eccentric, but Lennon opened up rock-and-roll to politics, and in an innocent, impulsive way, he worked for peace. Young people loved him for that and the music. Not so young now, they are behaving as though a President had been killed. An unacknowledged President who stood for peace, Lennon is inextricable from their memories of Vietnam and the moratoriums. Lennon had all the most alluring qualities of the 1960s: innocence, spontaneity, seditious humor, belief. In an interview on the day of his murder, he expressed the hope that the 1980s, like the 1960s, would be a decade of positive action. Now, with Moscow and the West activating their military reserves, it would be a far better remembrance of John Lennon to work for the peace movement he believed in than to long nostalgically for the decade he symbolized.